Pace Law School welcomes international law faculty and students to register teams to compete in the 10th Pace/ICLN International Criminal Court Moot Competition. The annual Pace/ICLN ICC Moot Competition, for which I served as Student Chair last year, serves as the "Round of the Americas," and is the English-language qualifying round, for the ICC Moot Competition to be held at The Hague, at the ICC itself. The competition is held in collaboration with the International Criminal Law Network, the Dutch government, and the Open Society Institutes. What began as a small competition has grown in size and stature over the past decade. The purpose of the competition is for students to develop expertise in international criminal law as practiced in forum of the International Criminal Court. Over time, the competition has served to educate a wider public in the jurisdiction, procedures, and substantive law utilized by the ICC in the prosecution of individuals charged with war crimes, crimes against humanity, and genocide. Competition problems reflect current, pressing international criminal law issues such as the crime of aggression and the prosecution of ritual servitude. Students from across North, Central and South America have participated in the Pace ICC Moot – including students from Canada, Brazil, Mexico, Trinidad & Tobago, as well as from across the United States. Past judges and keynote speakers include: Ben Ferencz, former Nuremberg prosecutor; Philippe Kirsch, the first President of the ICC; and David Scheffer, the first U.S. Ambassador-at-Large for War Crimes Issues, as well as his current counterpart, Stephen J. Rapp. The competition also co-hosts a colloquium with the Open Society Institutes, featuring an interactive forum of prominent international law practitioners. 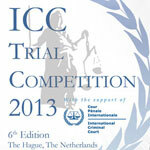 Registration is now open for the 2013 Pace/ICLN Moot Competition, which will be held March 1-3, 2013, at the law school, in White Plains, New York. The Pace Law School round is open to all English-speaking law students, excluding LL.Ms. To register, please complete a registration form and submit it to ICC Moot Student Chair, Dhara Patel, at PaceICCMC@gmail.com. Extended Registration closes on November 2, 2012. Please note that due to special circumstances this year, the Competition will not be posting the problem on the website until mid-November. Once teams have been registered and payment is received, the problem will be sent to a team representative via e-mail. We are also looking for qualified professors and practicing attorneys to judge and grade memorials (to be completed before the Competition). Judges may receive CLE credit.